Travel insurance or visitor insurance is critical to have in case of some unexpected situation like medical emergency or loss of important travel documents. One question that baffles the minds of many prospective visitors is the decision, whether to buy the travel insurance from USA or from India (or any other home country). It’s a difficult question for the visitor who is traveling to USA for the first time. In this case, he is unaware of the situations that may arise during his travel to or stay-period in USA. When airlines and travel agents reserve/sell air tickets, they ask the traveler to purchase the visitor insurance; the visitor follows their advice and purchases this insurance, unknown to the limitations of this transaction. For him it seems easy and quick to purchase insurance from the agent who sells him the travel tickets. But, it may turn out totally unexpected and create lot of stressful scenarios later. Let’s understand the various reasons that emphasize why travel insurance while traveling to USA, must be bought from an authorized USA-based insurance agent/provider, instead of a local insurance provider. In the table below, we have summarized the factors that must be considered while making the insurance purchase. These factors are later explained in detail. The table also makes it clear that buying insurance from US is quick, effective and preferred in terms of better plans, timely service and better benefits. In the United States, for an individual or an organization to become licensed insurance provider, they have to go through a formal training and examination system. This process makes sure that the agents know how the country’s health care systemoperates. These licensed agents understand the functioning of the system and are in a better position to serve their visitor clients. This is in contrast to the home-country (Indian) agents/airlines that normally sell the insurance like over-the-counter product, with the air tickets. These agents only explain what is mentioned in the insurance plan but are at a loss to help the visitors understand the minute necessary details. Therefore, rely on US insurance agents than Indian brokers for better understanding and services. For a visitor, it is very useful as well as important to understand the procedure to be followed in case of some untoward situation. If the need for healthcare arises, when the visitor goes to the doctor/hospital, the first thing that is required is the visitors insurance details. Now, there can be two problems. Many Indian/local insurance companies are not recognized or may not be known to the US medical providers. This will quite possibly delay the health care or assistance. Also, the visitor would be paying upfront to them from his own pocket, and later on would have to go through the cumbersome and tiring process of filing claims when he is back in India. This creates stress, both in USA when the assistance would be needed at the earliest, and also on return to the home country, dealing with the unreliable and tedious insurance process. On the contrary in US, there is a Preferred Provider Organization network to which insurance companies are connected and these are known and recognized by the insurance providers. This network has already in place contracted doctors, hospitals and other providers. Therefore, prefer US insurance agents than Indian agents for better services. It is a big relief to have an insurance card in your wallet. In case of any emergency, it’s as simple as just taking it out and presenting it before the concerned authority. An insurance card details the name & other relevant information about the visitor, as well as explains through the policy number, as to which coverage plan has been opted by the visitor and what the benefits are. The visitor doesn’t have to explain his insurance details to the doctor/any other authority. US insurance companies normally ease this and make an insurance card available immediately to the visitor when he purchases a coverage plan. Local home-country insurance agents generally do not make it this simple. Therefore, prefer to buy insurance from US than from India as US insurance agents provide a comprehensive ready-to-carry insurance proof. Since the PPO network identifies the doctors and medical caregivers, the hospitals and other care organizations can directly bill the insurance company. The visitor has nothing to worry about. In case of insurance taken from an overseas insurance company, it is highly possible that since the insurance company is not recognized within US, the patient (visitor) can not avail the ease of direct billing. He generally has to undergo the lengthy and tedious process of claim filing and reimbursement. Therefore, prefer US insurance agents over Indian agents to avail the ease of direct billing. It is always convenient to have the option to extend or stretch the duration for which the insurance has been bought previously. 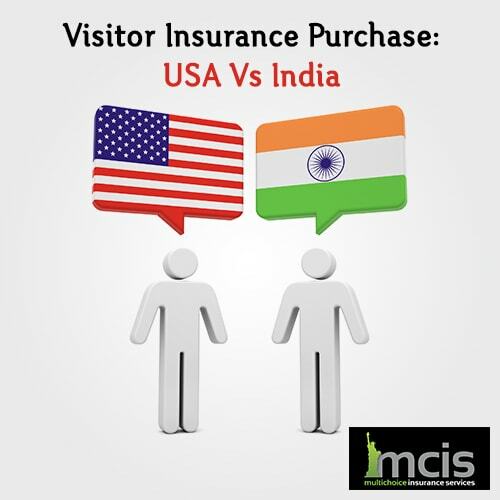 If the visitor insurance has been bought from an US insurance company, depending on the purchased plan, it is possible to renew the insurance for one, two or three years. This holds true even when some claims have been filed under the existing policy. Insurance bought from India is not renewable. If a person extends his stay in USA, he has to repurchase the plan and this is only possible if he had no claims filed for the previous/existing policy. Moreover, he can’t buy it from an Indian company now. Therefore, prefer buying insurance from US as it’s possible and easy to extend the duration of insurance (conditions apply). Just like postponing the departure, sometimes a visitor might want to pre-pone his departure. In such cases, US insurance companies refund the balance amount, under the condition that no claims have been filed for that policy, and that they would charge a minimal cancellation fee. However, no such refunds are possible with insurance bought from Indian firms. Therefore, prefer buying insurance from US than from India to keep it flexible the duration of your visit and at the same time incur less financial loss. The time difference between the USA and India is big! Buying insurance from an American company provides customer service in the same time zone. The visitor can make use of their service in time of urgent questions etc. Whereas, for India, he has to take into account the time difference, and this may create uncalled tension and troubles. Therefore, it is better to buy insurance from US agents than from India because the former can help you on real-time. Most of the US insurance companies have all the details related to various insurance plans, online. A prospective visitor can visit the website, read, get instant quotes, make comparisons and make informed decision effectively without spending lot of time dealing with manual paperwork. Online purchases are not very prevalent in India. Therefore, buying insurance from US gives an option to read all the necessary details on internet, and also make the purchase in almost no-time. A live chat on the broker’s website also enables to discuss the plan and resolve the queries that may bother prospective visitor’s mind. This is mostly and generally not possible in India. Depending on the chosen policy, with insurance bought from an American insurance agent, both the inpatient and outpatient benefits and services are available for a visitor. With the Indian insurance plans, it is imperative to check for availability of outpatient benefits, which may include radiology, visiting a doctor or buying prescribed medications. Therefore, prefer to buy insurance from US than from India so as to have the facility and benefits of outpatient treatment. Most of the India based insurance firms, provide Fixed Coverage Plan. This means, that the insurer pays a certain amount (deductible) per policy period or on every incident of a loss/sickness, and then the insurance company would pay the maximum amount for that particular condition. It is a basic medical plan, and does not cover compensation for loss of baggage or travel documents. US based insurance agents offers a flexible and more comprehensive coverage plan, which is known as Comprehensive Coverage Plan. In this plan, the visitor pays the deductible and then the insurance company pays 80% of the first $5000 expenses, and the visitor pays the rest 20%. We will discuss about the different types of coverage plans in our upcoming posts. Therefore, prefer to buy insurance from US than from India as better plans with more financial benefit are available. In case of some problems or disputes with the US insurance companies, insurance regulatory authorities in US can be contacted and the government is very strict for this industry. Whereas, with insurance bought from an Indian company, US Government is not liable and the visitor has to manage his problems/disputes on his own. Therefore,prefer to buy insurance from US than from India as insurance industry is highly regulated in US than in India, which makes dispute solving easier and quicker. The experienced and licensed insurance agents at MCIS offers free and timely help during claim processing and are available 7 days a week & 365 days a year, from 9 am to 9 pm. Our clients are most welcome to call us in case of any question or problem! We don’t believe in computer-assisted service. When a client calls MCIS, he is greeted by a live person with knowledge and experience to help him in all possible ways. We are simple and friendly, isn’t! Quote-Compare-Buy and Fly!